Driven by robust industry activity, Zhanjiang's economy showed strong growth in the first half of this year, with its gross domestic product (GDP) increasing by 6.1 percent year-on-year to 136 billion yuan ($19.9 billion). Local fixed-asset investments, total retail sales of consumer goods, general public budget revenues, and tax revenue all achieved double-digit growth over the first six months of 2018, increasing by 13.6, 10, 11 and 13.6 percent, respectively. The growth rate of traditional industries, such as home appliances and aquatic processing, exceeded 10 percent, while that of the modern service sector hit 10.9 percent. The total output value of the marine economy grew by 13 percent to 87.3 billion yuan. 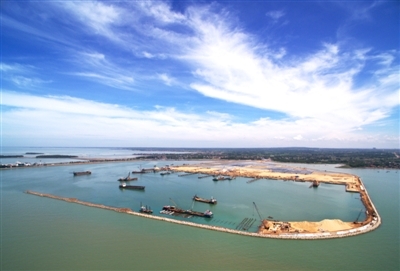 A number of large companies, including China Shipbuilding Industry Corporation, China Merchants Group, OCT Group, Sany Heavy Industry, and China Communications Construction, invested in Zhanjiang. BASF, a German giant in the chemical industry, plans to establish a $10b Verbund chemical production site in Zhanjiang, which will be its largest investment to date. A non-binding memorandum of understanding was signed on July 9. In addition to inspiring economic performance, Zhanjiang has made great strides to improve the living standards of its citizens. From January to July, the city spent 19.1 billion yuan on livelihood projects, 82.4 percent of general public budget expenditures. There are now 3,400 medical institutions in Zhanjiang, providing 35,091 patient beds. A total of 1,173 rural schools were also renovated or expanded during the same period, with 420,000 square meters of new campuses being built. To advance rural rejuvenation, Zhanjiang has renovated 15 kilometers of county roads and 54.8 kilometers of village roads this year, while hardening 489.6 kilometers of road surface and repairing 14 dilapidated bridges. Over the past six months, investment in local transportation infrastructure has risen by 74.3 percent to a record-breaking 7.4 billion yuan. 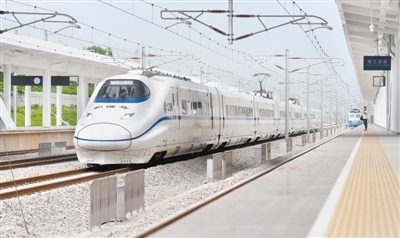 The opening of the long-awaited Jiangmen-Zhanjiang rail line has brought the city into the high-speed railway era. In the meantime, the expansion of Zhanjiang Port's 300,000-ton shipping lane has been approved by the State Oceanic Administration. The cargo-passenger ro-ro terminal at Xuwen Port has completed over 60 percent of its investment plan.